I recently attended the second annual EventTech conference and expo in New York. It was a chance for me to learn more about “leveraging social media + technology to optimize live events,” as the event describes itself. There were several good sessions…however, there was one I think you’d find particularly interesting. It was called “FutureCast 2032: What Will Events Look Like in 20 Years?” Joe English, creative director-experiential marketing at Intel, led the discussion. We will know far more about the audience. Contextual tools and data management will be important. And we’ll move from a shotgun approach to more of a sniper rifle approach when marketing to potential delegates. We will gather much more about audience behavior. Once again, contextual tools will play a role in this, as well as relatedness engines and RFID/GPS. We will make more useful suggestions to our audience. Yep, you guessed it—contextual tools and relatedness engines will play a role in this. Our attendees’ roles as ambassadors will increase. This will be achieved via future social media technologies. Technology will be the delivery vehicle for information. Distance learning technologies will drive this. Technology will connect attendees with one another at events. A couple of these predictions tick me off. While I hope this statement is true in the future, the notion that new technology is needed to make better suggestions to event audiences annoys me. First, this formulation sides with the old worldview that treats event attendees not as adults but as children who need an external authority to determine what they need to learn. That’s training, and most successful organizations abandoned years ago the concept that the majority of learning comes from training. Second, we know now how to allow people to control their own learning at an event; i.e. via well-designed participant-driven process that uncovers needs and matches them to the considerable resources available from the people formerly known as the audience. Unfortunately we rarely allow this to happen. I think we will find that future technology will not do as good a job at making better suggestions for our audiences when compared with what can be done now with well-tested, straightforward participative process. #3 started the pressure build-up, and #6 brings me closer to boiling point. I guess this is what you might expect from a director of marketing at Intel—when you only have a hi-tech hammer, everything looks like a hi-tech nail. 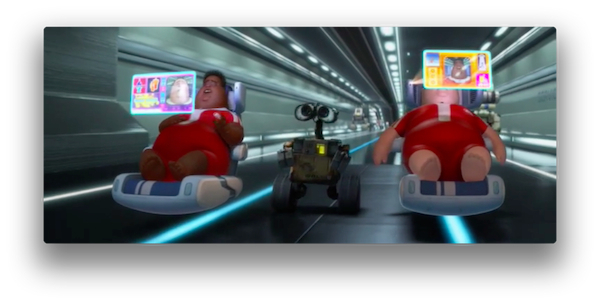 Joe’s pronouncement evokes the world of WALL•E—Disney’s 2008 movie about a future where obese humans live in outer space, barely able to move about, interacting with each other via advanced technology. Is this the vision of the future we want? I’m a fan of virtual and hybrid events, and see them as providing important ways that technology can create new opportunities for us to be present at an event that we would not or could not attend physically. But in my opinion, baldly saying that in the future technology will connect attendees with one another at events goes too far. The human race has spent hundreds of thousands of years developing ways of connecting face to face. Unless we have holodeck-quality technology that creates a reality essentially indistinguishable from our face-to-face experience, I don’t believe that technology will replace the quality of connection and engagement that routinely occur at well-designed face-to-face events. Sadly these days, I routinely see queries on LinkedIn groups asking about the latest “hot” technology for events. This is sheer laziness that benefits no one except lucky tech suppliers. Instead of looking for new technology to make an event novel, spend your time incorporating process and formats that will fundamentally improve the quality and value of learning and connection at your event. And if this leads you to incorporate appropriate technology to support these activities, then your event dog will be wagging its tech tail, the way that nature intended, rather than the other way round.